I'm gonna come clean. I judge books by their cover. There, I said it. I just can't help myself, good cover design gets me every time. EVERY TIME. You guys have no idea just how many books I have purchased solely based on their covers. Oftentimes it really works out and the book turns out amazing but sometimes I get a few that are terrible books but have great covers. Also, cover redesigns sometimes get me. Even if I already have a copy of a book with the original cover, if there's a cooler redesign I have to get the new one. I have a problem. Obviously. 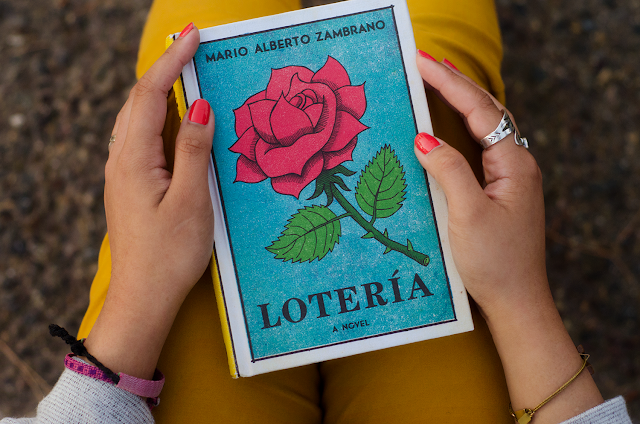 Anyway, I came across this charming little book Lotería: A Novel by Mario Alberto Zambrano. I mean, look at this cover. LOOK AT IT. As soon as I saw it, I had these fond memories of playing lotería as a kid with my family. I knew that I had to have this book, even if the story was awful, it wouldn't matter because the book cover was so beautiful and the illustrations inside were equally as beautiful and besides I had a coupon for it! Yay coupons! So lotería's protagonist is an eleven year old girl named Luz who currently finds herself in a government home for children who are currently displaced or have been removed from their homes. Her father is in prison and her sister in critical condition at the ICU. Luz won't speak to anyone as is the cause of the traumatic events leading to her arrival at this home. 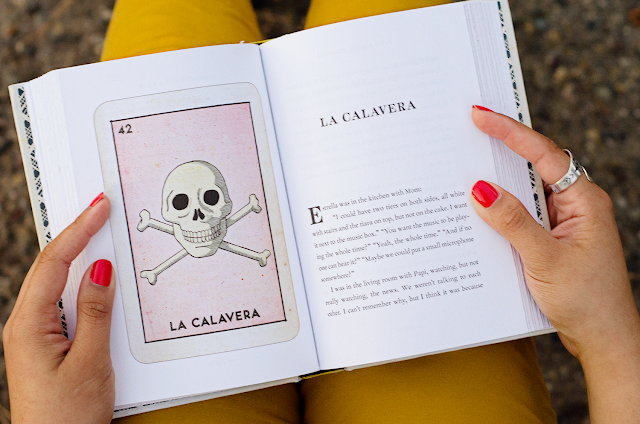 At the encouragement of her aunt she begins to write in a journal to see if she can piece back together what happened and to prove her father was innocent by using the lotería cards to spark her memory. Each lotería card if you're unfamiliar with comes with an illustration. These images remind her of a memory, some good memories, others, not so good. But it is through these memories that as a reader we can piece together what has happened to Luz. This heart wrenching unique little novel reads so beautifully. You don't even need to be a native spanish speaker or even had to have played lotería to understand the beauty of a child's innocence. I love books with child protagonists like Pigeon English and The Curious Incident of the Dog in the Night-Time because children will just tell you how they feel. The innocent mistakes they make are endearing and the kids themselves can have a humor that is unmatched by an adult. But I can tell you that being a native spanish speaker and having had played lotería before made this book much more enjoyable just because I can relate to having those relatives who always are urging you to never forget your roots as well as all that spanglish that's spoken in the home. If you're unfamiliar with lotería, by the way, it's a Mexican game similar to bingo but instead of numbers the cards have an array of images and there is an accompanying deck of cards with illustrations instead little numbered balls. The dealer reads the card's illustration out loud and you mark it off your card if its on there. Usually you use beans to mark off your card or you can also use small coins like pennies. Apparently I've been playing lotería all wrong since in the book it mentions how all lotería cards have a riddle, so the dealer gives the riddle instead of reading the card and the players have to be attentive and wise enough to guess the correct illustration on their card. They way I've played it the dealer reads off the names on the cards really quickly like those men at auction houses and you have to claim lotería before the next card is dealt or it doesn't count. Either there are different ways of playing the game depending on the region of mexico or my family has lied to me and we've played the game all wrong. Anyway, I hope you get a chance to pick this gem up. It really is unlike anything else I have read--a perfect debut novel from author Mario Alberto Zambrano. You can catch up with Mr. Zambrano via his tumblr. Enjoy! haha i totally pick out books by their covers too. I might not buy them, but i at least read their little jackets. I mean, you took a huge chunk of your time WRITING the darn thing- you cant put some effort into its face? And i love this books cover, it's so vibrant. And the story sounds interesting- I like first person/journaly stories. lol marlen you always make me laugh! haha. yeah i think im a big fan of first person/journal stories too! Love the book cover, it's awesome! And I am totally guilty of doing the same thing.. ahha. lolol im so glad im not the only one!